I was reading Anita Osterhaug’s post in the weekly Weaving Today letter about teachers and the knowledge they impart. She quoted ” When the student is ready, the teacher will appear“. I had not heard that before. She then added, “Sometimes you carry a teacher in your head until you are ready“. This was amazing to me as it is the very thing that has been going through mind this week as I work on my new book. 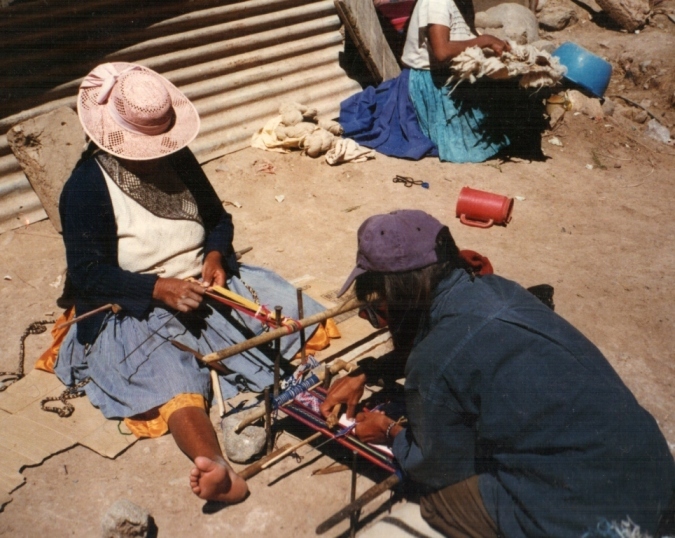 Almost sixteen years ago I learned backstrap weaving with my first indigenous teachers in Peru and I find that even after all this time has passed, certain things they taught me which I have been performing mechanically since then, are suddenly taking on a whole new meaning. I can take certain processes which I now clearly understand and apply to them to other situations and create things I had not been able to previously envision. It is hard to explain and I know that this all sounds a little vague but I am much more explicit in the book. It is nice to know that I have been carrying those teachers around in my head, as Anita said, all these years and can still benefit from what they showed me. I wonder how many of my other past teachers will make an appearance as the years go by and what seeds of knowledge are sitting in my head waiting for just the right conditions in which to sprout. So, I thought I would dedicate this blog post to some of my weaving teachers and say just one or two things that I took from my experience with them. This is Hilda, my teacher in Potosi, Bolivia who taught me “once a weaver, always a weaver”. How must it feel to have been raised a weaver, as Hilda most likely was, having this activity become a part of your very being and identity only to have to abandon it at a relatively young age. Hilda started out in my lessons by sitting by my side and pointing or calling out the warps that I needed to pick up for my design. Apart from warping with me and setting up the loom, she never once actually sat at the loom and showed me how to weave so there was a lot of “no, not like that” as I was not being given a model to follow. She complained that her eyesight was too poor and her back too weak to weave anymore. Besides, she said that she had forgotten most of the patterns. However, I started to notice that my piece was growing somehow from the time I left it in the evening to the time I arrived the next morning to pick it up again. Hilda simply couldn’t resist unrolling my work and weaving when I was gone but still felt somewhat shy about weaving in front of me. I am sure that weaving in the low evening light was not helping her. Eventually, she gathered the confidence to start weaving together with me on her own projects in broad daylight leaving me to figure out the pattern for my own work on my own. Happily, I was well on my way by that time. The other thing I took from Hilda (although it didn’t stick for long) was the idea that cloth should have four selvedges. This is the most natural thing in the world for weavers in Hilda’s world and a weaver finishes her piece without any fuss. Hilda sighed and muttered only because of her poor eyesight. One doesn’t choose, as I do, whether to have fringes or three selvedges with a fringe at one end. There will be four selvedges and that is that. It gave me the confidence to go straight home and weave a few pieces like that in wool, although, as I said, it didn’t stick, and once I started weaving with cotton, I stopped weaving four-selvedged fabric. Felipe in Salasaca, Ecuador has been my only male weaving teacher so far. 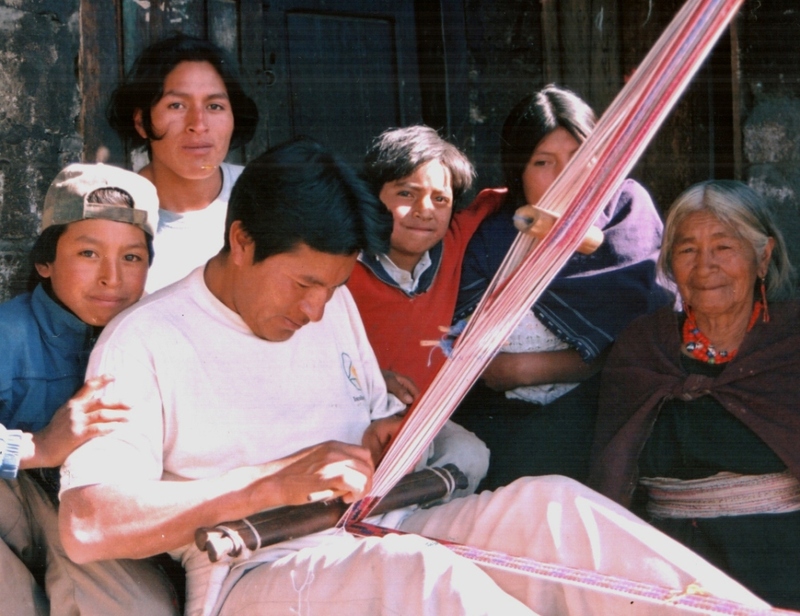 I was most impressed by the fact that Felipe has taught all four of his sons to weave (one son is absent from the picture) and that they all approach it with such enthusiasm and pride in a world where fewer and fewer youngsters in indigenous communities show any interest in learning to weave. I wondered what Felipe’s secret was. Although the boys didn’t yet have the skill to warp well, they could certainly tell me exactly what was going on as their father demonstrated it to me. Felipe told me that he was self taught and has created some of his own variations of the traditional Salasaca “frutilla” pattern. His bands are cut into pieces to decorate sandals which are made by a local shoe maker. He is obviously an innovator with plans for the future and perhaps this optimism is what he has passed to his boys. 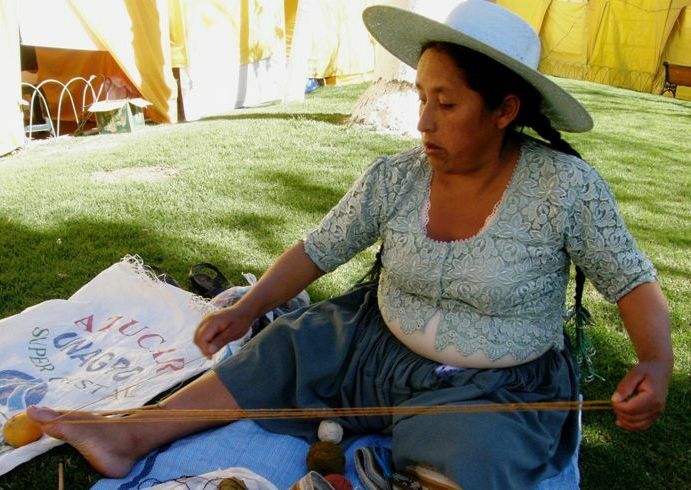 As I prepare to travel and pack my portable warping board, loom bars, dowels, metal rods, beaters and shuttles I remember Maxima in Cochabamba and the ease with which she wound warps on her finger and toe. All we had a was a pleasant shady spot outdoors, a few balls of yarn and we were able to spend several lovely afternoons producing pebble-patterned and tubular bands. Yarn was used for cross sticks, fingers formed picking crosses and a hand moved with a slicing action beat the weft into place…the wonderful simplicity of it all. I went home and looked at my buckets of loom bars and beaters for all occasions! Of course they are needed for wide pieces but I tend to depend on them very much even for the narrowest of bands. 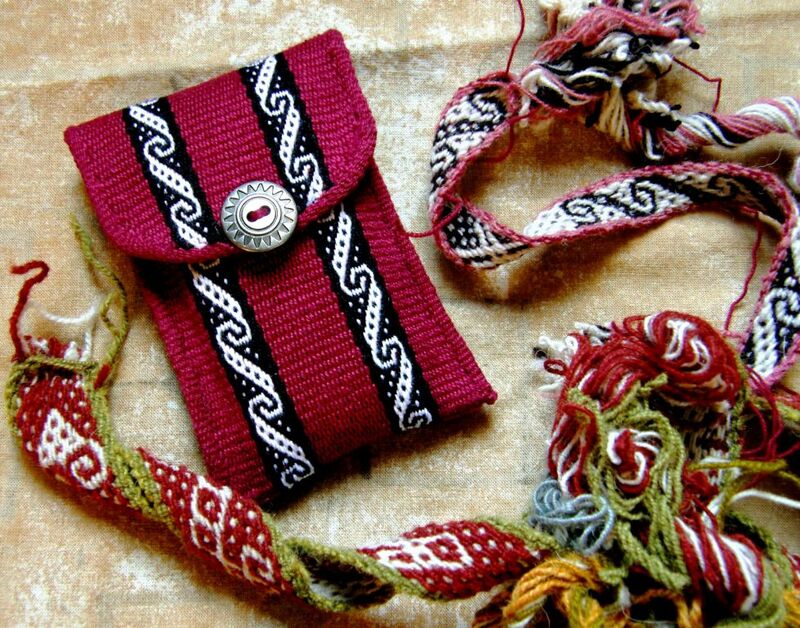 I also took home a new pattern which I used on a cell phone pouch and the knowledge of a new way to do pebble weave. Learning to weave with a family in coastal Ecuador showed me just how much an entire family can become involved in every aspect of the process from cotton boll to finished project….together most of the time sharing the tasks or at least keeping company with the person doing the work with lots of chatter and laughter. 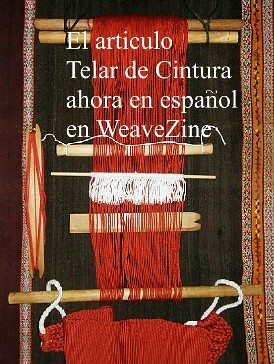 I tend to think of weaving as a very solitary process. Don’t speak to me when I am warping for goodness sake! and I can’t even listen to songs let alone chat while I am doing pick-up. Trini made mistakes while she warped but the discovery of her mistakes only led to teasing and laughter rather than frustration. 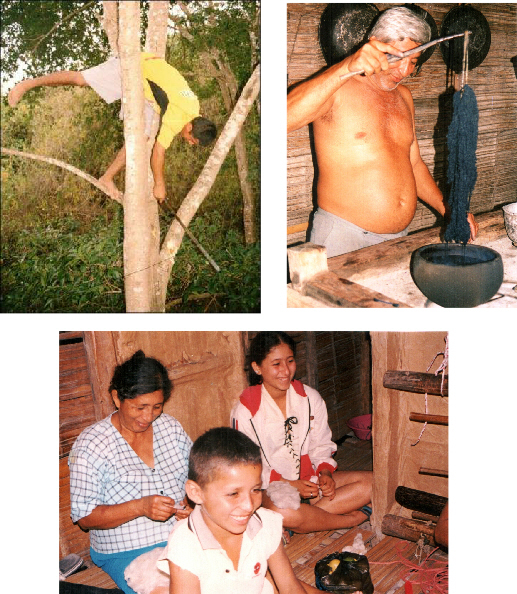 Trini is the main weaver but there are plenty of other family members involved in other parts of the process. A nephew cuts material for dyeing, a brother tends the dye pot and everyone helps to remove seeds from the cotton after the evening meal. A sister doubles the handspun cotton singles, all the adult women spin and Mother checks that the pattern-shed warps have been correctly selected. I am trying out spinning on this occasion. How nice it was to be sitting with this group of ladies and spinning the evening away. You can see that pretty much everything takes place on the floor. Wooden chairs hang from nails on the wall but Trini’s mother is the only person who sits in one. Maybe it was this experience that has me now so comfortable doing everything related to my weaving on a small square of bedroom floor. 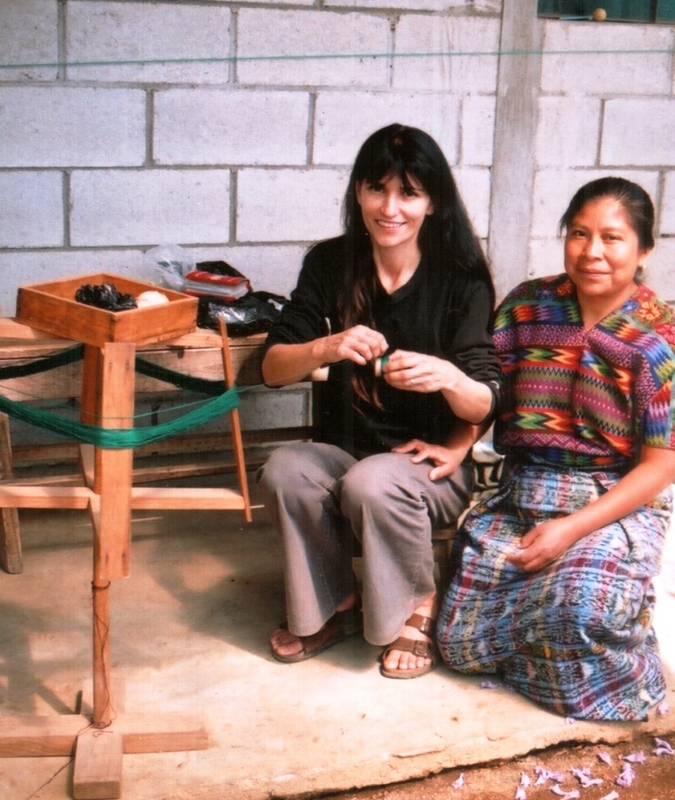 My first Guatemalan weaving teacher, Lidia impressed me with the amount of care and time she took preparing her warp. She is a quiet, calm and graceful person and this all carries over into her weaving. Every single warp thread was patiently and delicately lifted on the tip of a pointed stick and placed in its correct position on the loom bar. 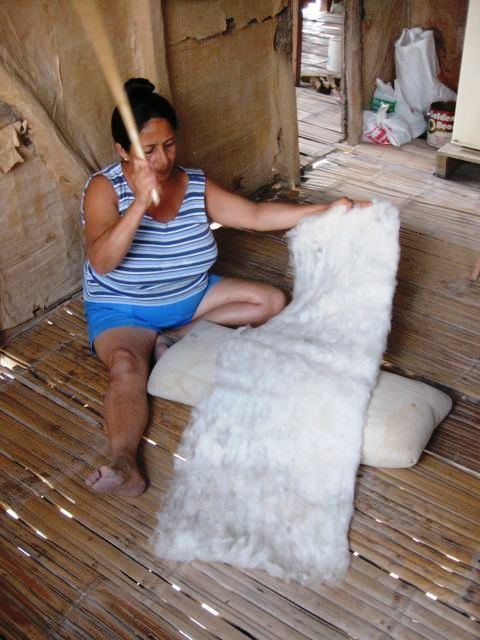 She didn’t treat it as the tedious thing that one has to do before the weaving begins. 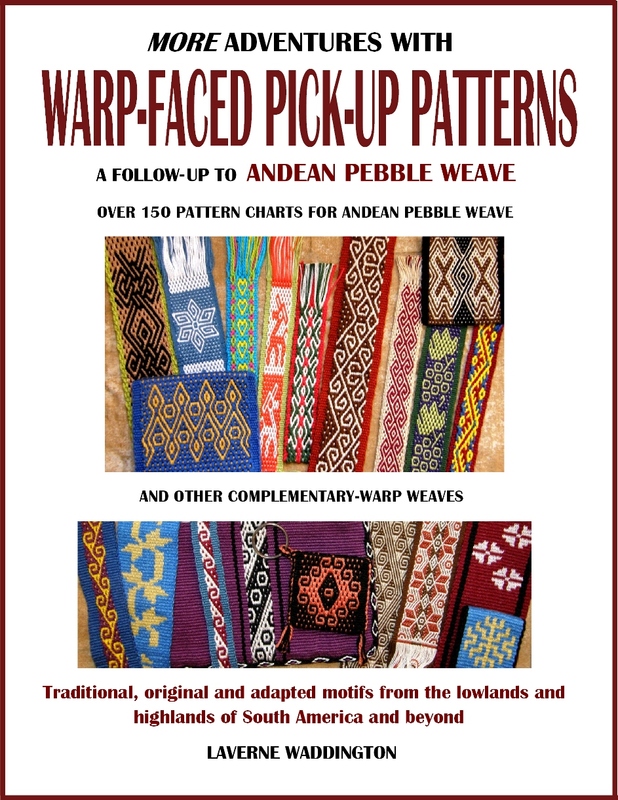 After weaving with Lidia, I started to take everything slowly and really enjoy every part of the process devoting as much time to warp preparation as I am willing to spend selecting the threads to create the patterns. I loved how Lidia would have me un-weave mistakes. That is just what I like. 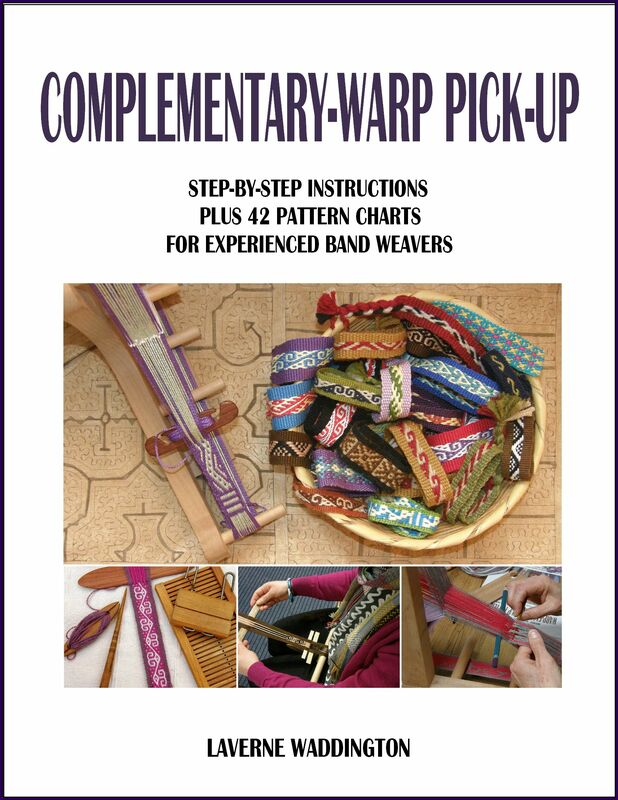 I have had many weaving teachers who have gotten annoyed at my insistence on fixing errors. In Potosi I would sometimes take my warp home at night to fix an error I had made early in the day that Hilda had not let me un-weave! I have to say that Lidia had a way of spotting a mistake about to happen! She was quite amazing like that and saved me a lot of un-weaving. I also learned about the efficient use of materials. I have never met a weaver who knows how to measure so precisely the amount of supplementary weft she needs to complete each of the different motifs in a piece. Angela, my Guaraní weaving teacher, blew me away from day one. 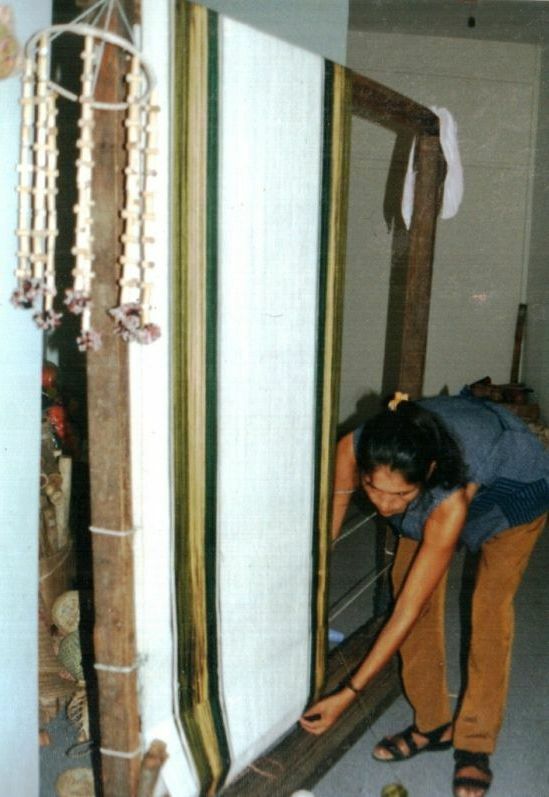 She was warping a hammock on a vertical loom and I watched in awe how she passed the warp thread thousands of times up and over the loom, bending down low to pass the thread under the bottom beam and then reaching behind to pass it around the dovetail cord. And then there were the thousands of heddles! Not just one set but three. Many years later, I got together with Angela again and now she impresses me in other ways with her appetite for learning new techniques and looking for new ways to do things. I could sense that my teacher Maxima in Cochabamba wanted to learn double weave from me but was shy to come right out and ask. She doesn’t know how to do the “eye” pattern tubular band either but did not seem interested in learning that. Angela saw my string heddles on a stick on day one and, recognizing that knowing how to make them could be useful, said “Teach me that”. She is willing to learn any new method or skill that comes her way. And I know that she will teach others in her community to make them too if she thinks that they will help make weaving more efficient. I have come across strong competitiveness in weavers between and sometimes within communities where information like this would not be shared. Don’t get me wrong…I am not condemning that. Everyone likes to have that “edge”, right, especially if weaving is putting food on the table. 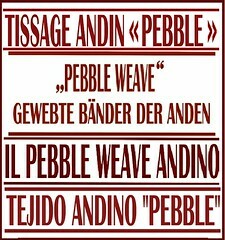 I taught a young man in Ecuador to do pebble weave. When I returned eighteen months later to see how he was getting on (very well), I had his brothers begging me for lessons as Juan was refusing to teach them! 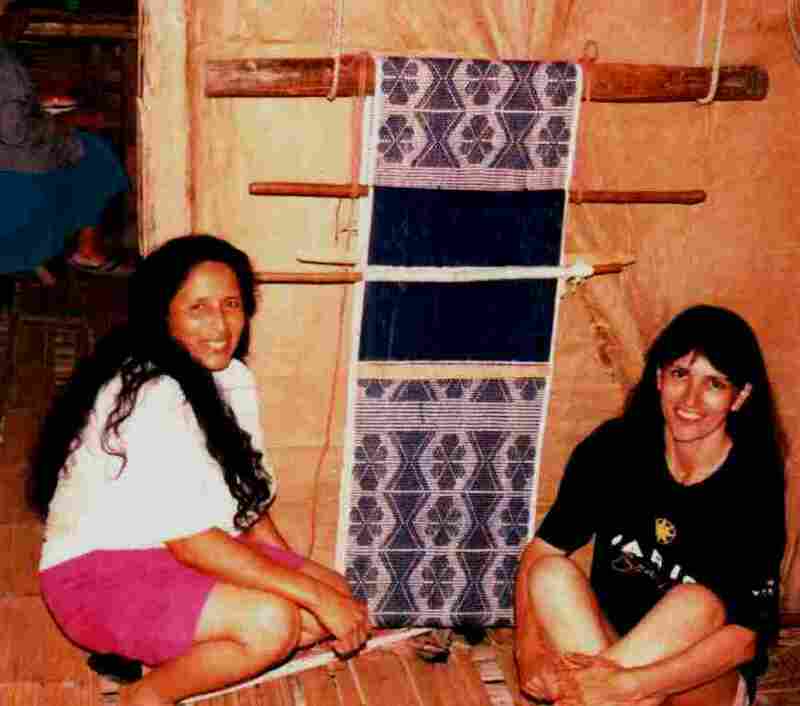 Below you can see Angela talking about Guaraní weaving at a gathering of highland and lowland weavers. 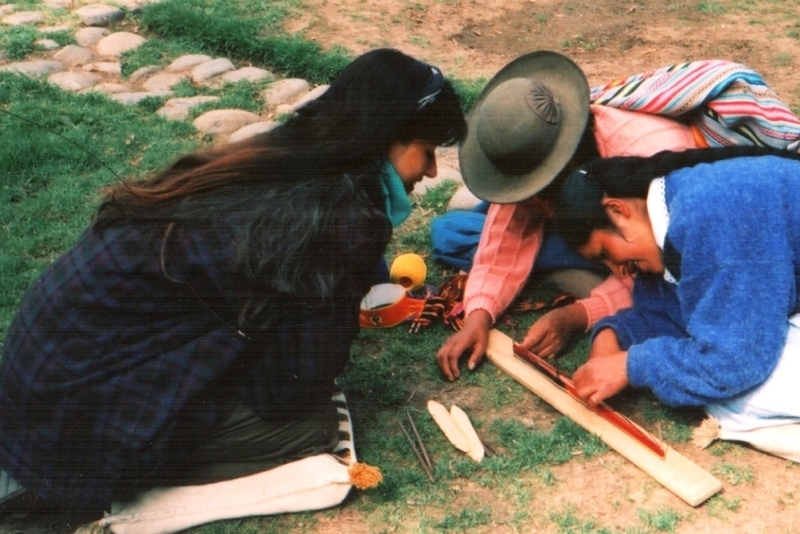 School children were able to try weaving on a small warp that she prepared. 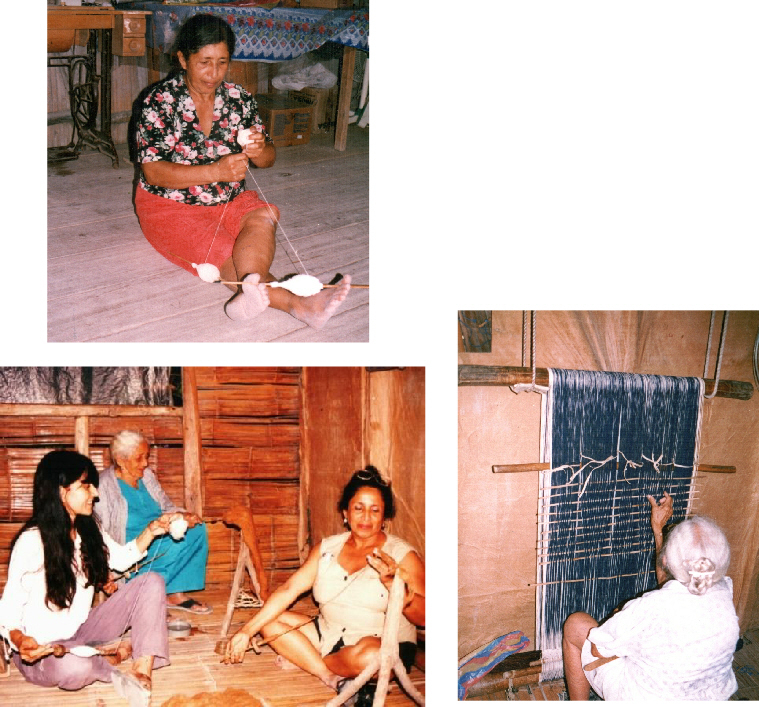 Angela is one of a group of people and institutions responsible for the spread of knowledge and the growing appreciation here in Santa Cruz of Guaraní weaving and culture. 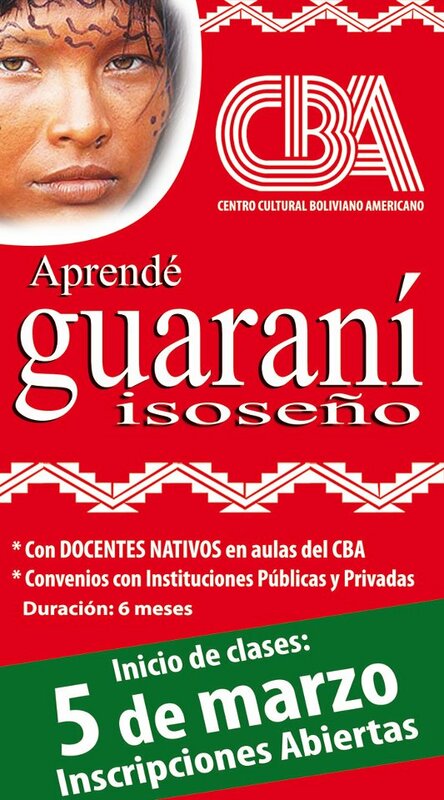 Even the institute where I used to teach English is now teaching the Guaraní language. You know I could just go on and on. There are many more teachers to talk about. I carry them all about in my head, as Anita says. I write up all the techniques that I learn in journals when I get home and weave samples and paste in step-by-step pictures. What I don’t write in the journals are the little bits and pieces that I have mentioned here and it is kind of nice to have this blog in which to remember and record such things. 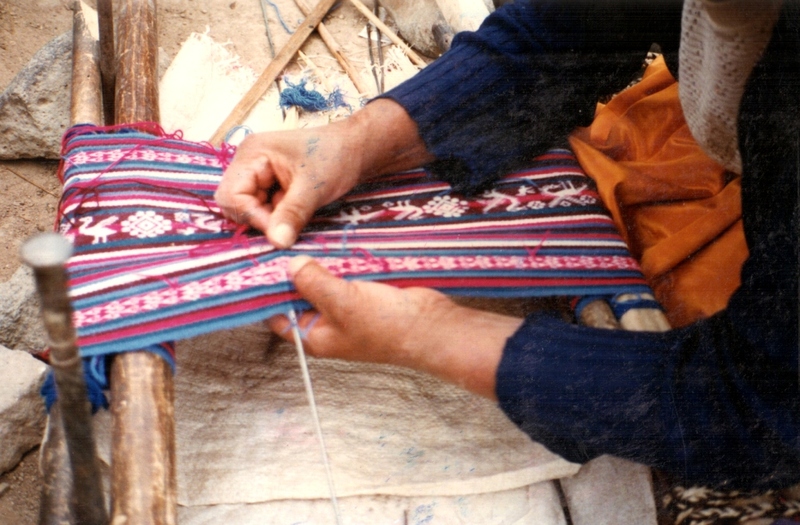 Hopefully I will write a future blog post about some of my other weaving teachers from other parts of Ecuador, Peru, Bolivia, Chile and Guatemala as well as the Asian ladies with whom I have studied more recently in the US. You have already met most of them here. I have one thing to show you before I go. 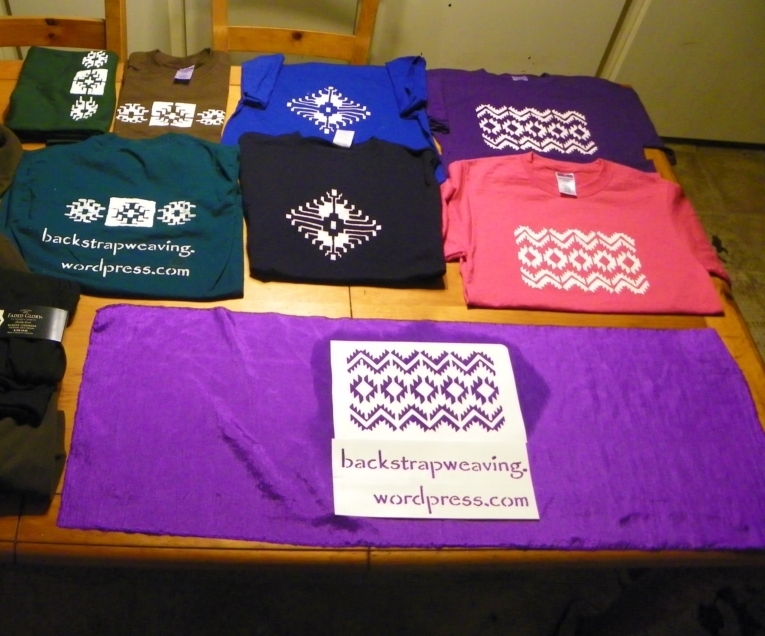 An online weaving friend of mine in Florida made me some t-shirts. 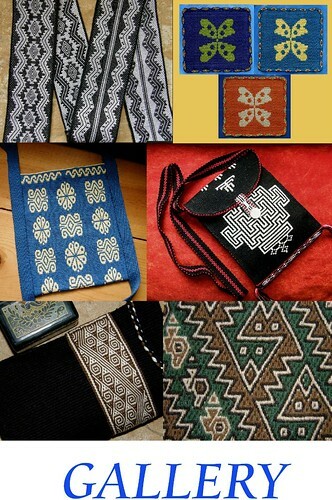 She cut the stencils and painted them herself using some motifs from weavings that I have done. One of the designs is the Guaraní snake motif. These are so cool! I look forward to wearing them on my next trip. 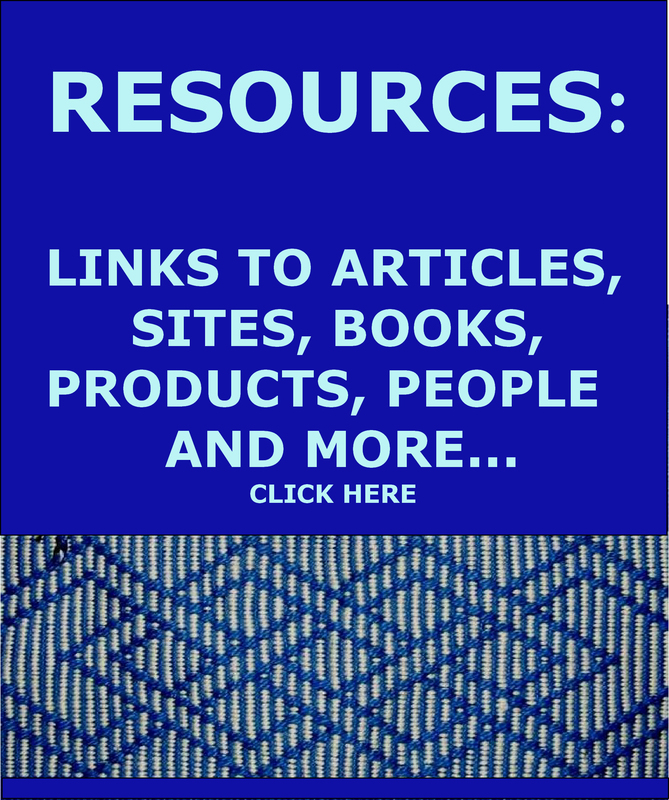 « Backstrap Weaving – Announcing….Events, Books, Resources! Thanks Kathie. I know that there are a lot of tshirts in that picture but Sharon made them all for me! She knows how “non-clothesy” I am and wanted to save me the hassle and stress of shopping for clothes for my trip. I love them! I don’t know what she thinks about making some to sell. I will send your comment to her. All your teachings are in my head too! Recognize these? You are sooooo sweet! Made my day, thank you.